start your very own successful travel business from home. The franchise business model offers you the franchisee the ability to grow under a successful brand and leverage the tools, systems, training, experience and resource of the parent company. A franchise is typically significantly lower risk in terms of investment and success rate. Travel is the worlds largest legal industry and is a very pleasant industry to be involved in. Due to the generous commission available you do not need millions of customers, in fact just a couple of hundred customers over time would give you an amazing income. When you couple this with the lifestyle benefit of being your own boss and working from home, along with the great perks on offer you can easily see why so many people are turning to The Travel Franchise & Not Just Travel. We are huge believers in personal development and entrepreneurship. With The Travel Franchise you have the opportunity to build either a part time, full time or life changing income and we will be with you every step of the way. Success leaves clues, and we have a history of success having won multiple awards and accolades from across the industry. “it’s no good knowing how to book a holiday if you have no customers”. We don’t just sell you the vehicle to create income, we teach you how to drive it. We have a very long term view towards our partnership, most notified by the Not Just Travel money back challenge. This exclusive programme allows you to earn your entire franchise fee back! Our business model is second to none and unlike some of our competitors who have been doing the same thing for years and years, we have a history of innovation and strongly believe in the mantra of continuous improvement. The franchise business model offers you as the franchisee the ability to grow under a successful brand and leverage the tools, systems, training, experience and resource of the parent company. A franchise is typically significantly lower risk in terms of investment and success rate. Travel is the worlds largest commercial service industry and is a very pleasant industry to be involved in. Due to the generous commission available you do not need millions of customers, in fact just a couple of hundred customers over time would give you an amazing income. When you couple this with the lifestyle benefit of being your own boss and working from home, along with the great perks on offer you can easily see why so many people are turning to The Travel Franchise & Not Just Travel. We are huge believers in personal development and entrepreneurship. This is not a business where you are a home worker and we throw you a few leads from time to time. With The Travel Franchise you have the opportunity to build either part time, full time or life changing income and we will be with you every step of the way. 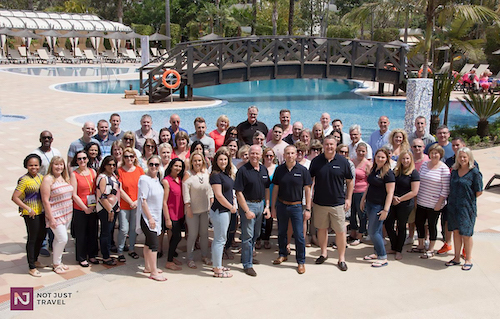 With hundreds of franchisees we have attracted people from all different backgrounds, cultures and walks of life. Ranging from single parents who want to earn extra income, employees disillusioned with their existing job, and successful business owners who are looking to diversify, there is something for everyone. You DO NOT need any experience; we can teach you everything from scratch. As long as you have a passion for travel and aren’t afraid to promote yourself then everything else is in place. The fact you are reading this shows you are “open” to possibility. Our business is full of people from all different backgrounds who have realised there is another way… that they don’t have to build someone else’s dream. They can build their own. Having worked for a major High Street bank for 10 years after leaving school, I know what it is like to not be happy in what you are currently doing and yearn for something else. Becoming a home based entrepreneur is a brave step. It’s not for everyone, but in my opinion it beats the groundhog day of being an employee and making someone else rich. By becoming a Travel Consultant with us you will join a huge family, a network of like-minded individuals all with a common purpose. Our training, support and mentorship is second to none and improves each year as we add new innovations to our business. We invite you to check it all out and see for yourself.